Need a break from study? CASSA has just the thing for killing time on campus. 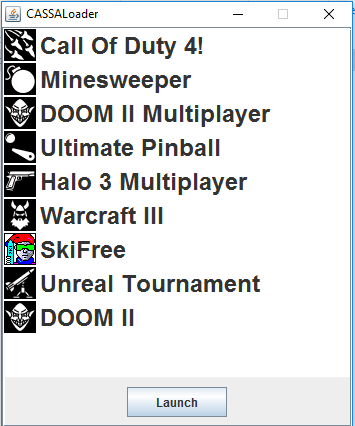 We have a collection of games that can be quickly and temporarily deployed to any PC on campus. At the prompt choose “Open With | Windows Explorer” and open the Executable Jar File. This should work on most campus PCs but if Java Runtime isn’t installed; such as in the library. Then the .exe “Application” should be run instead. When running the .exe version Windows Defender Smart Screen will popup a blue warning box. To continue you will need to click the “More info” link and then select “Run Anyway”. Despite the blue warning box this software is perfectly safe to run on any machine. The application makes no changes to the system and only retrieves software/games from a dedicated system within CASSA infrastructure. Note: The CASSA Game Loader has been designed to work only within the confines of the university network and will not function over the Internet.